As exibited at Ufo Precents, Berlin, Germany. 2012. Materiales: 2x70 l. water containers, distilled water, steamer, ventilator, cold water aggregate, pump. A sustaining circulation of vapor likened to some of the most extreme wind formations in nature, is almost hypnotizing to behold. 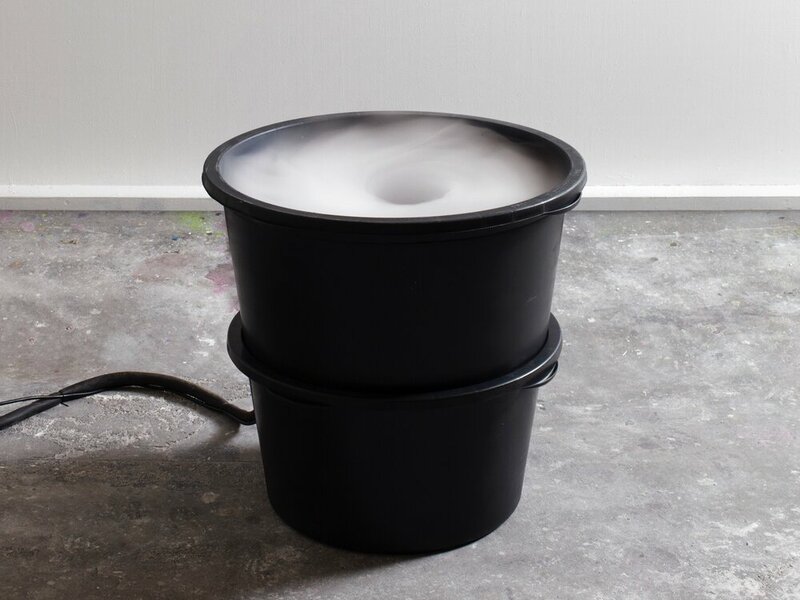 As a part of an exhibition on wind this work shows both how wind appears and how fast it travels. It is a representation of a real-life vortex which is created by wind moving from top to bottom in a continuing movement which means that it holds itself. The circulation works both horizontally and vertically and these movements draws you into its continuum of repetition on the border of getting lost in nature’s self-sufficiency.